People all around the world love to vacation in places where they can enjoy the water. For those who don’t have backyard pools or nearby beaches, water parks provide the exciting opportunity to have fun in the water anyway. Indoor water parks offer the additional benefit of freedom from the weather, allowing visitors to have a good time rain or shine. On top of all the usual exciting water park features, the largest indoor water parks boast a wide variety of unique attractions and a whole new level of enjoyment! Let’s learn about 10 of the largest indoor water parks in the world and look at the fun attractions offered by each one. The Coco Key Water Resort in New Jersey offers water slides, a lazy river, a state-of-the-art arcade, and a delightful culinary selection. Three of their water slides stretch to between 300 and 350 feet long and offer plenty of twists and turns to keep things interesting. One of the most popular attractions at New Jersey’s Coco Key Resort is Parrot’s Perch, an interactive aquatic jungle gym for children. Texas’ newest and largest water park, Epic Waters, boast three different slides that are the first of their kinds in the industry. Eleven slides in total give guests the opportunity for a thrilling plunge into the water, but the 50-foot Yellowjacket Drop is said to be the most exhilarating. Alongside the classic water park attractions, Epic Waters also features a selection of artistic studios, a game room, and a fitness center. 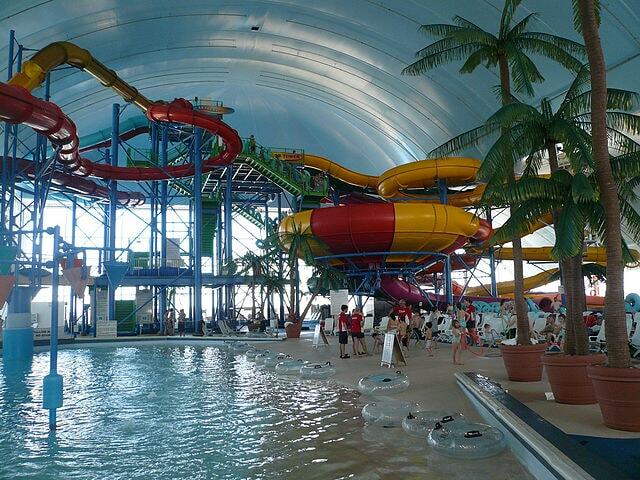 Located at the center of Boyne Mountain Resort, this impressive indoor water park is open year-round. In addition to thrilling water rides for visitors of various ages, Avalanche Bay also provides a children’s pool, a lazy river, and hot tubs. A well-rounded variety of food and drinks are also available for all guests. The most famous of Avalanche Bay’s six waterslides is The Big Couloir, which thrills riders with the steepest drop in the water park industry. 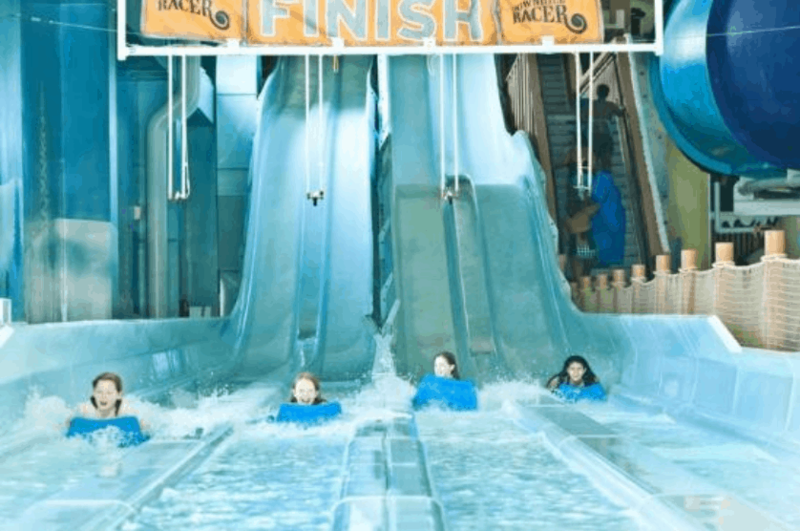 Located at Falls Avenue Resort, the largest resort in Canada, this indoor water park offers tourists a whole new way to experience the excitement of Niagara Falls. This park is only a short walk away from Niagara Falls, and offers 16 waterslides, a wave pool, and an indoor hot springs. People looking for an experience to remember can look into the Beach House Rain Fortress, which features a 1000-gallon tipping bucket. The Kalahari Resort chain boasts several appealing vacation spots throughout the United States, and some of the largest indoor water parks. The Wisconsin Dells location offers a wide variety of attractions from a kid’s play area to a bar that serves people in the water, ensuring that the whole family can have a good time. The Wisconsin Dells Kalahari Resort offers kids the opportunity to take surfing lessons, or even lessons on how to impersonate a mermaid. 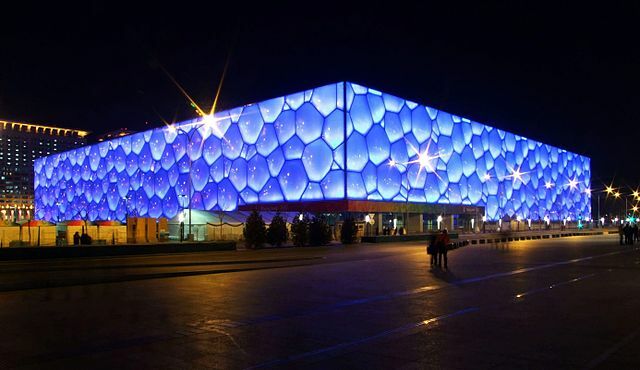 While shaped more like a rectangular prism than an actual cube, the Beijing National Aquatics center immediately impresses visitors with its unique architecture. The square shape of the building hearkens to a traditional Chinese idea that the Earth is square while the sky is round. The beautiful, striking architecture has earned this park the nickname “Water Cube”. While the Water Cube now houses water slides, river rides, and other tourist attractions, it was formerly the venue for the Beijing Olympics. 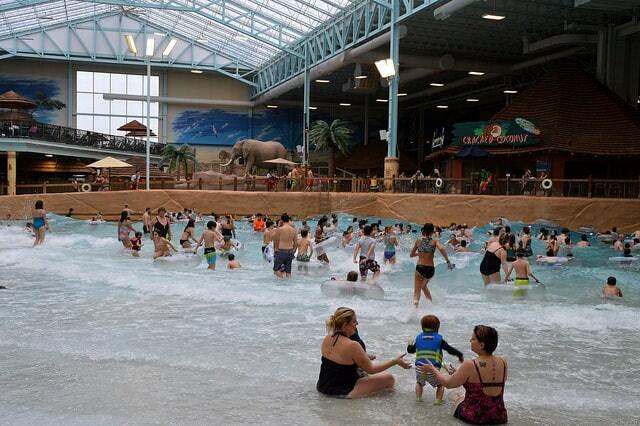 Formerly the largest indoor water park in the United States, the Kalahari Resort at Sandusky, Ohio carries on the same African-inspired themes as other establishments in the chain. The Sandusky resort has been expanded since its original opening, offering more attractions and features than ever before. Visitors looking to expand their horizons can head over to the pottery studio or the outdoor animal park that complements the indoor water park section. While this park originally opened with an area of 100,000 square feet in 2015, an expansion in 2017 more than doubled its size. 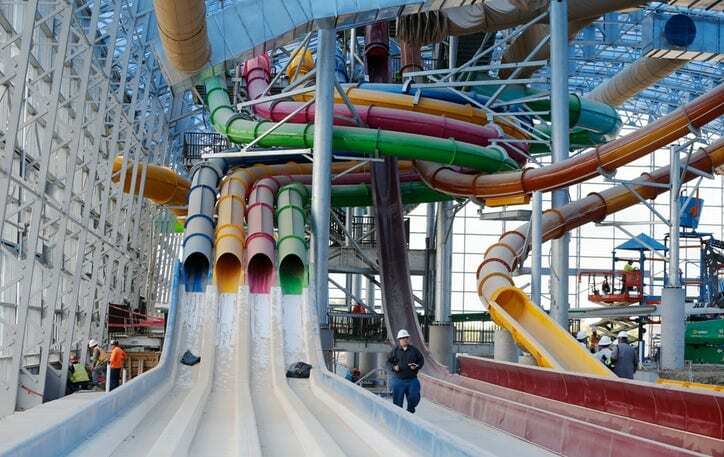 It reopened after its expansion as the largest indoor water park in the United States. The Poconos location of the Kalahari Resort chain offers everything from the usual water slides and wave pool to arcade games and a bowling alley. 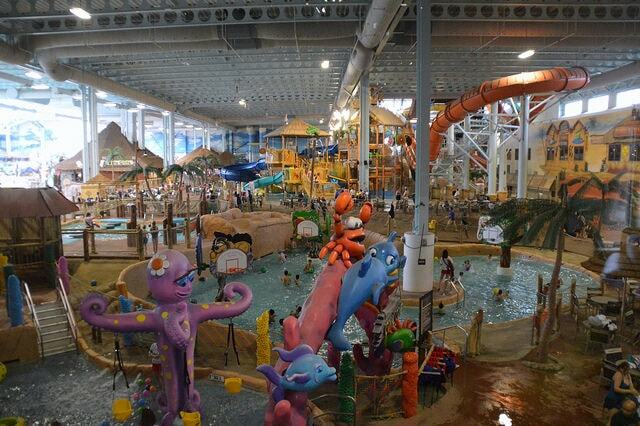 The Poconos’ Kalahari indoor water park is geared towards providing a fun experience for the whole family. 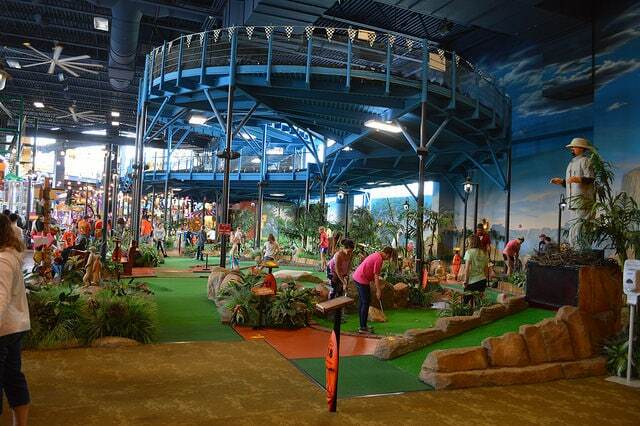 Children can experience Kamp Kalahari, while adults enjoy the spa and shops. 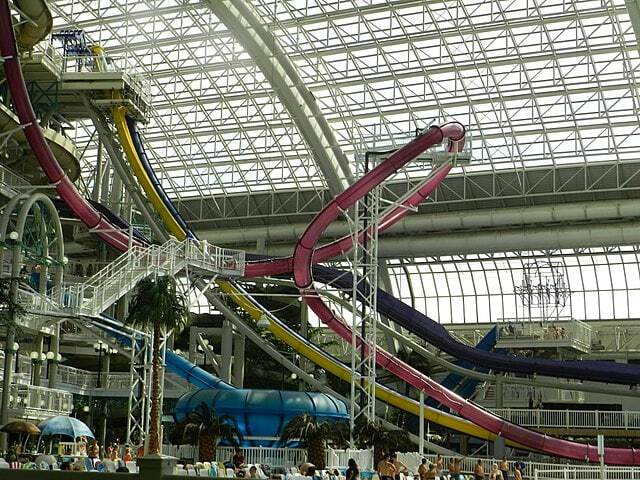 World Waterpark is located in the largest mall in Canada: West Edmonton Mall. This massive water park has room for around 5,000 guests and presents an array of water slides to choose from. The star attraction is the Tornado, a huge water slide that takes guests through a fast, 360-degree loop. World Waterpark is home to the world’s largest indoor wave pool, as well as a FlowRider surfing attraction known as the Tsunami. 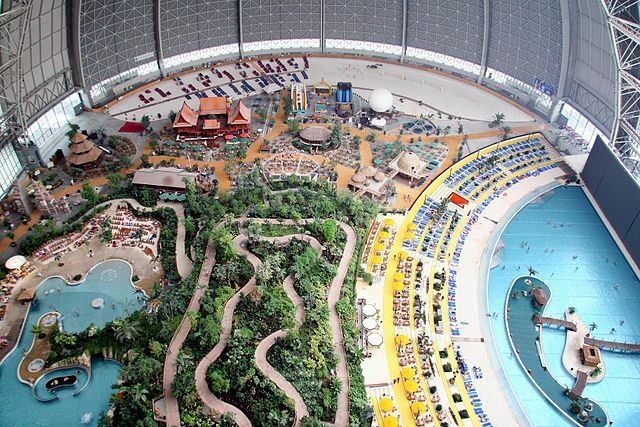 Tropical Islands Resort is the largest indoor water park in the world. This astounding water park was built inside the framework of an old German Airship Hangar and boasts Germany’s largest waterslide. The unique architecture of the building comes together with elements like artificial sunlight and waterfalls to create a wonderful atmosphere. As if the exhilarating water slides and beautifully crafted indoor scenery weren’t enough material for a good time, guests can ride hot air balloons to the islands!